Single homologations took place before and also after the product-stop. Until 1976 became actually almost everything changed, which evenly still permitted the regulation (whereby for example the 50 times manufactured hood with the two auxiliary headlights and air intakes, which was used usually only at night, was already used 1975). Most important measure was however without a doubt the Abarth fourvalvehead, which should be used also in the Lancia beta work racer and in the mentioned Abarth 019. It was already free given by the FIA in March 1974, but works first in October 1974 at the Ronde Cevenole under Pinto/Bernacchini - and landed at place four. With 11:1 the consolidated engine with still larger sucking in cross sections and improved fine heaving of cranking and valve impulse achieved proud 205 HP in connection with the weber double carburetors 48 IDF when 8000 revolutions! Impressing was also the flat torque run: 18,5 mkg with 3500 U/Min; 21,2 mkg with 4200; 23,3 with 5000; 25,3 mkg with 6000 and maximally 26.9 mkg with 6600 U/Min! New was the Abarth-gearbox instead of the Colotti-fivegearbox (Abarth reductions 2.706 - 1.973 - 1.551 - 1.238 - 1.0) and borrow & Beck clutch. The 16-valve two-litre-versions of 1975 finally marked the fullpower. With the mechanical ball-fishery-airless-spraying-plant - which was for the first time already tested at the end of of 1973 and at that time to an increase in output on 190 HP had help - and extra large aspirating pipes came this 124er-fullpower-versions to 210 to 215 HP. Additional air intakes and differently arranged instrument panel let this car from the "mass" the Abarth Rally out-sting - whereby the colors of the competition cars were identical to those of the yearly 1974. For the first time the powerfull CSA was used by the victorious team Verini/Russo with the Rally San Remo in October 1975. The afterwards following respected place with the RAC Rally by the same team was naturally no fame sheet. End of the year the 16-valve growed up to 210 HP with 8000 routes! In rally-racing felt this aggregate as clearly more cultivated than the earlier 8-valve. At all the 124er-Chassis served now before all as testbed for various Fiat-131-engines. In addition, the weak points showed up clearly: Too often overheating antishocks and brakes as well as the restriction of the chassis tuning by the rear independent suspension, which made a further setting lower impossible. At the end of of 1974/at the beginning of 1975 got the work racers in the back even double shock absorbers, recognizably from the fenders with the large air intakes, pulled out still further. 1975 had reached the insanity in the house Fiat its high point: Sandro Munari (in former times on the Fulvia successfully) and Mario Manucci triumphed with now again the delivered Rally Monte Carlo on to compromiseless 240 HP strong Group-4-Stratos before Mikkola/Todt (4 minutes arrears on the superior winner). Alen/Kivimaeki and Bacchelli/Scabini, all on that 205 to 210 strong 16-Ventiler Abarth Rally. For the first time here some running stables - under it Fiats - had furnished to radio communications between team and crew. But: At the same time on two hot running teams of two marks to set, the Turiner would have had to cost normally 1.25 million, whereby one half million of it were only allotted to Lancia. However main sponsor Alitalia bore these cost. Actually one would have also had to recognize in the meantime that the employment of seriesnear cars would have been more favorable like 131 in place of the Stratos taken off the paragraph... First thus the running departments of Fiats and Lancia fused, the Squadra Rally fell under the direction of Cesare Fiorio. The march direction was perfectly clear: From 1976 to 1981 from Bertone arranged actual and from Abarth prepared 210 to 230 HP strong sedans determined the happening. 1977, 1978 and 1980 came it to world champion honours. But also in the year 1975 some remarkable successes brought the last employments of the 124ers: With the TAP Rally Portugal (Markku Alen/Illka Kivimaeki and Hannu Mikkola/Jean Todt at the places unity and two), and with the Rally San Remo (second Verini/Rosetti with injection behind Waldegaards Stratos, developed in the meantime, became). And with the Stuttgart Lyon Charbonnieres went both first places at Fiats: Maurizio Verini and Fulvio Bacchelli had made a running. But at the end it was enough nevertheless only to the second place in the mark valuation; Lancia was appropriate in front, for Alpine Renault followed behind it on the third place. 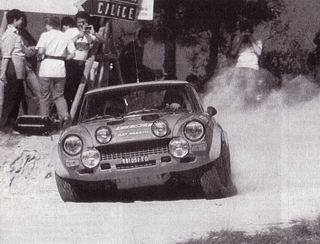 Nevertheless, Maurizio Verini/Francesco Rosetti became European champions - with victories with the Costa Brava, the Stuttgart Lyon Charbonnieres, the Firestone Rally, Yugoslavia and Poland Rally. And Cambiaghi/Sanfort could sun themselves in the gloss of the Italian championship. There are much questions about the future employment vehicle of the Fiat company: auto, motor und sport forecast up to the 220 HP strong Abarth 019 Prototipo 2000 a large future, during confirmed spider-pilots wanted to hold to " the wonderful drifting 124 Abarth" (o-tone Markku Alen). But the work commitment for the 124er ended in the March 1976 and went smoothly over at the mentioned two-door 131, which carried 140 HP out in the civil version, in the running trim with injecting he came up to 210 HP. In the years 1977, 1978 and 1980 thereby world champion honours were reached. For the season beginning of 1976 the lacquer finish of the work racers had been again specified: The dark-blue basic lacquer finish and the yellow flared wings and strip corresponded to the colors Fiat-own lubricant manufacturers of the Oliofiat. This enterprise co-operated closely with Abarth and availed themselves among other things of a sophisticated Fiat-124-engines, in order to optimize engine oils in accordance with the regulations of the Coordinating European Council (CEC). 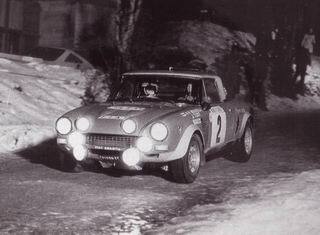 The most active time of the fast 124er however was past: In 1976 the 16-valve-injections were not with the completely large Rallys any more with it, after with the Rally Monte Carlo Markku Alen became only sixth, Roberto Cambiaghi only figured eight and Maurizio Verini only 15.. The victory went - to expect as differently - at the Lancia Stratos, which reserved directly all three first seats - driven from Sandro Munari, ex Fiat driver Bjoern Waldegaard and ex-alpine-Pilot Bernard Darniche. "In order of that, an automobile terminates its sporty career, which was intended for lovers of beautiful cars and sporty tourism", titled by the Fiat 131-press-kit. Later particular the Fiat dealer Heinrich Unterholzer from Schlanders in South Tyrol was still for a long time with adventurous derivatives of the 124er Abarth Rally on the mountain runways of Europe. He was strating with a two-litre four-valve prototype in the group 5 (clearly identifiable by the enormous, external air intake) came in such a way on 240 HP! 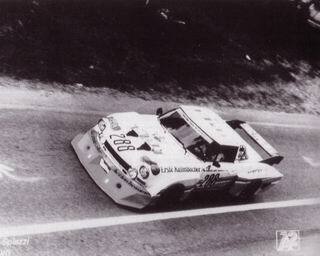 At least with regional Rallys, mountain running and slalom 124er Abarth's and Series-Spider were used. 1985 put Pininfarina, under whose direction starting from 1981 the spider-production should run, to the totip team two spider-europa, which started in the middle of the eighties at various Rallys in Italy - provide set lower, more strongly, but from Homologation-bases not with the VX compressor. The Glory days of the 124 in the sport however was past. Today they are stars of club and classical author meetings for example with the meetings at the edge old timers of the Grand Prix on the Nuerburgring. When will it give the first special run there? In English and Italian classical author running they participate anyhow already, since then 1990 Waldegaard/Thorzelius on a CSA as ahead vehicle (starting number 00) to the Elba Rally participated. For example with the San Remo Rally Storico 1996 started directly several cars: in the route de France participated a group-4-CSA. The winner car of Alen/Kivimaeki at the TAP Rally Portugal of 1975 (124CSA0078559) was by the way further-sold in the middle of 1995 for approximately 100.000 D-Marks (50.000 �). Ten years before were to be had such racers still for completely small money: Thus at the beginning of the eighties a four-valve work racer in the exchange was offered to a good friend of the author against its much-run gulf 1 diesel! He is annoyed today still that he did not that... Some few work cars survived completely in the hand of Fiat Insiders, which had agencies or import business. The most other work racers had been however scrapped or dismantled.